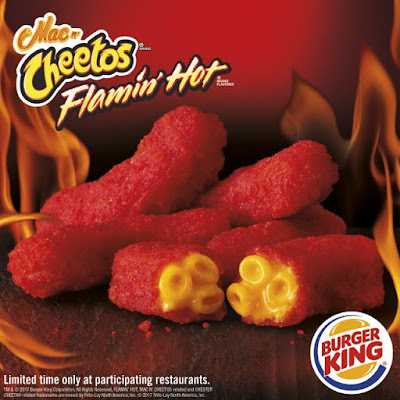 Burger King turns out a spicy version of their previously offered Mac 'n Cheetos with the arrival of new Flamin' Hot Mac n' Cheetos. Available for a limited time at participating locations, the Cheetos cheese puff-shaped fried snack features a center of creamy mac and cheese with a crispy battered coating flavored like crunchy Flamin' Hot Cheetos. An order of five carries a suggested price of $2.69.